Dr. Jeanne Aguirre, retired program coordinator/professor for SIU-Carbondale at Scott AFB, has over 40 years' experience in Education-- including high school, English as a Second Language, and Instructional Systems Design for military/business/industry students. She serves on several boards and committees at SIUE and in the metro-east, with special interest in promoting multicultural understanding and interfaith harmony. Dr. Aguirre is a member of the Baha'i Faith. Annie retired after serving for 21 years at her beloved Radiance Center for Spiritual Living (Religious Science) which she founded in 1990. She continues her ministry through Inner Splendor, an interactive informal monthly gathering for people of all faith traditions. Visit their website: www.theinnersplendor.org for more information. She is also the author of "Our InVisible World: Reflections on the Awesome, Loving Power of God Within Each of Us". Bob serves as priest at St. Francis Xavier Catholic Church in Carbondale and as the Ecumenical and Interreligious Office for the Catholic Diocese of Southern Illinois. He helps organize the annual interfaith Thanksgiving event and Week of Prayer for Christian Unity in Carbondale and is a participant in the Ralph Anderson Interfaith Dialogues. As members of the Baha'i community, Jim and Cindy reflect the passion of their religion in their interfaith involvement. 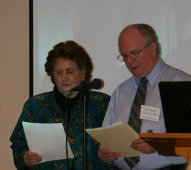 Lana, a minister with the Community of Christ, serves as the President of the Metro-East Interfaith Partnership. Father Kevin Laughery is a priest of the Catholic Diocese of Springfield in Illinois. From 1986 to 2017, he was active in the Greater Springfield Interfaith Association, serving four stints as president. He served as ecumenical officer of his diocese from 2002 to 2017, and as interreligious officer from 2011 to 2017. In July 2017 he became pastor of the Catholic parishes of Troy (St. Jerome) and St. Jacob (St. James). He is on the leadership team of the Illinois Conference of Churches and is active in its anti-racism team. He attended the Parliament of the World's Religions, Chicago, 1993, and Salt Lake City, 2015. Kevin takes his interfaith inspiration from the declaration on the relation of Catholic Christians to non-Christian religions, Nostra Aetate, Second Vatican Council, 1965: "The Church ... exhorts her [children], that through dialogue and collaboration with the followers of other religions, carried out with prudence and love and in witness to the Christian faith and life, they recognize, preserve and promote the good things, spiritual and moral, as well as the socio-cultural values found among these [people]." Father Carroll Mizicko serves as the priest at St. Augustive in East St. Louis and as the treasurer for our organization. Christopher Smith is a member of the Church of Jesus Christ of Latter-Day Saints and attends the Belleville Ward. He is the Bishop Emeritus of the Belleville congregation after having served as it’s Bishop for 5 years and has served in numerous leadership positions in the church. His current volunteer service includes work as the Public Affairs Director for the regional office of the church - O’Fallon Stake. This role involves interfaith work, communication with media, attendance at public relations events as well as encouraging compassionate service to others through putting faith in Jesus Christ in action. Chris is active in various interfaith organizations and serves on the board for the Metro East Interfaith Partnership (http://www.metroeastinterfaith.org) and has participated with another non-profit group, Racial Harmony (http://centerforracialharmony.org), on their Spiritual Wellness Panel. Chris served as a proselyting missionary for his church to Italy from 1995-1997 sharing his faith and participating in a variety of service projects and interfaith activities in addition to teaching conversational English. Chris serves as the Secretary of our organization and is one of the administrators for our website and Facebook page.